Just as with many of you, the cold weather has inspired me to stay in as much as possible over the last few days and focus on my quilty life and projects. I have always loved to use baskets for storage. On Sunday I finished appliqueing another Little Basket and I thought to get the rest of them out, where they were stored in a basket. 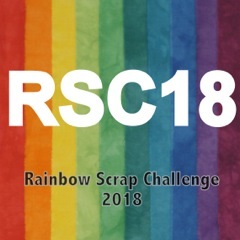 I’d just been following the Rainbow Scrap Challenge of the month suggestions for color over the last year…. As to a new project for this year, I completed another EPP ( English Paper Piecing ) Starflower. Tagged Little Baskets, Quilt Project : Little Baskets. Bookmark the permalink. Your little baskets are so cute and tempting to start making them but I laid hands on no less than 7 ufos today and have advanced 5 by prepping, choosing colours and clearing off sewing machines and tables so I can actually do some work on them. i’m sure it is freezing for you – my sister down in Williamsburg VA said it was -3 when she left work for home this morning around 7 AM — that is way to cold and she is a bit south of you!! here it is 39 and chilly rain all day but we will get warm for a couple days and then back to below 20 again for nights on the weekend – winter has barely started and we are all sick of it already – love all your projects. Hello, I like to use baskets for storage too. They are pretty to look at too. Your quilt stars are lovely. I’ve been collecting basket patterns for a while as I always love them. Yours are adorable and will make a lovely top. What wonderful stitching you do. I’ve been staying in too and hand quilting. I’ve gotten a lot done over the past two weeks. I’m also planning my next quilt, hoping to have one for each of the 10 grandkids. Fat chance of that happening though! I’m too slow – and too old! if you took the lid off that pretty basket, how long would it be before Kanga arrived to nestle inside of it? \Your basket blocks remind me of a postage stamp issued by the USPS some years back…..maybe in the 1970’s??? Very nicely done. I, too, love baskets and have a collection of pie baskets that I keep fabric in. I tend to buy a basket, fill it up, and buy another and do the same. A basket border!!!! You have used some really pretty prints in your basket blocks. I like baskets too. Especially Longaberger baskets. Your baskets should be in a cute little basket! Glad you’re staying cozy quilting inside your house while it’s freezing outside. I, too, love baskets for storage. Such pretty quilt blocks! And coupled with baskets, even better! Love the basket blocks being stored in a basket! !